A few days ago, I went to visit this very erudite scientist, a friend of the family, who lives in the US but visits India twice a year. Since he happens to be a foodie, who relishes and appreciates good food to the core, I try to make something for him whenever we meet him. And so I happened to take this porridge for him, only to hear from his assistant that he doesn’t touch finger millet! And when I told him what I got, he made no bones about his apparent dislike towards this grain, telling me that in his childhood, his mother made this for him when he was sick! It was with hesitation and skepticism that he took a spoonful of this porridge, not wanting to disappoint me, I presume. And then he took another sip trying to assimilate and ascertain the taste, like he would, his scientific dissertations. After the third sip, his face lit up and he said: This is good! Infact very, very good! And that is when I realized that one can make people like most ingredients, depending on how you cook them. And so folks, after a spate of decadent, rich and delectable treats, it is time for something healthy on divinetaste! It so happens that all the birthdays and anniversary in our family of three happen consecutively within a span of three months, March, April and May. And that’s when you will see some of the best baked delights, emerge from my kitchen. But, as a strong advocate of healthy eating, I like to balance the sugary treats with healthy delights. I really enjoy cooking with millets these days and make a variety of dishes with them. They are naturally gluten free and brimming with vitamins and minerals. And if cooked in the right way, they can be delicious as well. 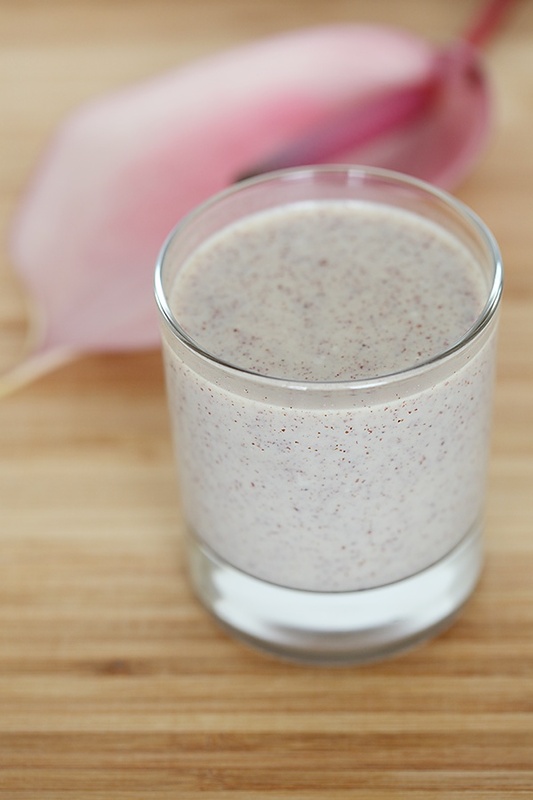 According to Ayurveda, finger millet is cooling to the body and this is ideal for a hot summer's day or for people who live in tropical climates. I make a variety of delicacies with finger millet flour. Dosas, rotis, cookies and this porridge. This has the most wonderful texture and a very unique, rustic taste to it. I have served this porridge to people across all generations, children, grown ups and the elderly and I have only got a thumbs up when I served this! Finger millet, known as nachni or ragi in Indian languages is also gluten free and rich in calcium, iron, fibre and other nutrients. Knowing this gives me great consolation, because my son literally grew up on this wonderful grain as it is one of the main constituents of the homemade baby food I gave him rom 6 months onwards. Despite being so nutritious and so good, it is sad that millet consumption is going down and the few farmers who are growing millets are battling many battles. It is quite surprising to note that finger millet consumption has come down even in states like Karnataka where ragi was one of the most popular foods. You can adjust the consistency of the liquid or milk to get the desired consistency. Use more milk for a thinner consistency to serve as a drink. In a pan, put in the flour and roast for about 2 to 3 minutes. Turn off the heat and allow to cool down a bit. Stir in the milk and mix well until there are no lumps. 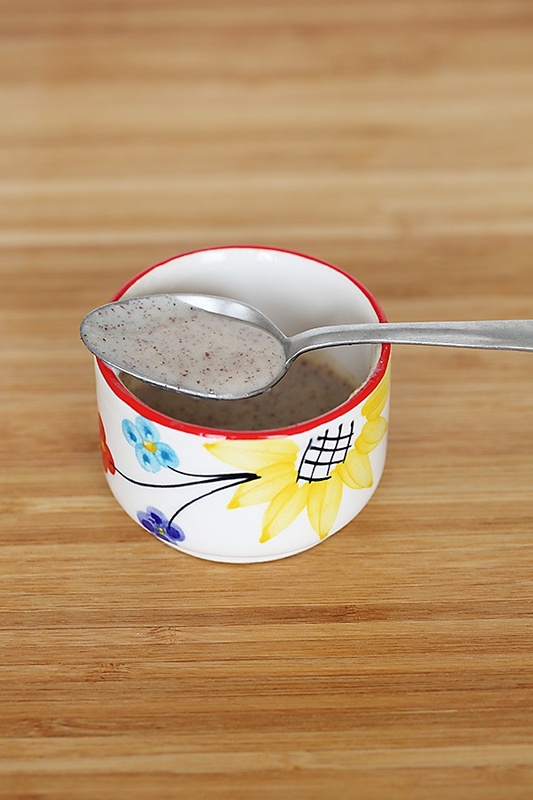 Turn on the heat again and cook until the porridge becomes thick and acquires a creamy consistency. Turn off the heat and mix in the jaggery and the cardamom powder. Pour into cups or mugs and garnish with the roasted almonds. Lovely recipe. Savoury version with buttermilk,green chilly,ginger and salt is also very tasty. Would you recommend having this cold, Anushruti? I eat ragi flakes with chilled milk these days and this seems like a food change from my routine. Amrita: Yes, this is one of the most delicious and simplest ways to include millets in the diet. Sandhya: Yes, that's amazing as well! Farha: Thsi tastes amazing with jaggery, although it works with raw sugar or brown sugar too. Thank you! My 20 month old doesn't like ragi very much but she does love her sweets. I'm sure this will be right up her alley. Thanks! Noodlehead: I'm quite pleased to hear that. Hope she likes it. 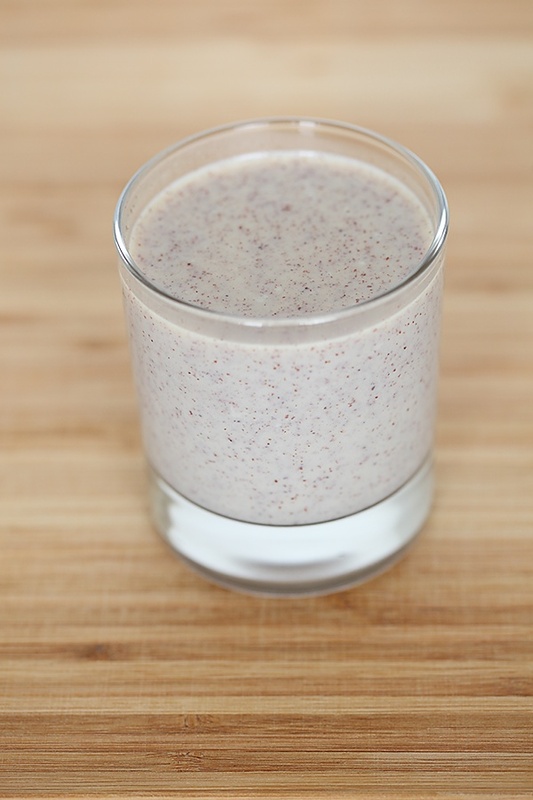 I am absolutely in love with this recipe…so easy to make and very healthy. My 2 yr old likes it too. I can see myself making it a couple of times a week. Thanks for the recipe. NS: I'm so HAPPY to hear that! Preety: Yes this is very simple and healthy. Hope your husband likes it. To finish what was given to me but not ask for more. My friend s mum thought I loved it and plied some more on me which I had to finish ( or so I thought and did). Obvious result was I threw up. This memory was so strong I didn't touch the stuff for a long time after. My paternal grandmother ( Annamma) made the yummiest halwa and forced me to try it and I got hooked …again. When do you recommend to have this and how often? During day or in the night? I live in Seattle, and unfortunately do not get ragi grains here. However we do get ragi flour. Is it okay to use ragi flour instead? If so, could you tell me how much flour I need to add to the mixture? I have a four month old, and just okay from his doc on introducing solid foods. If you have more baby food recipes please do share them. I'd like to give him home made food as much as possible. 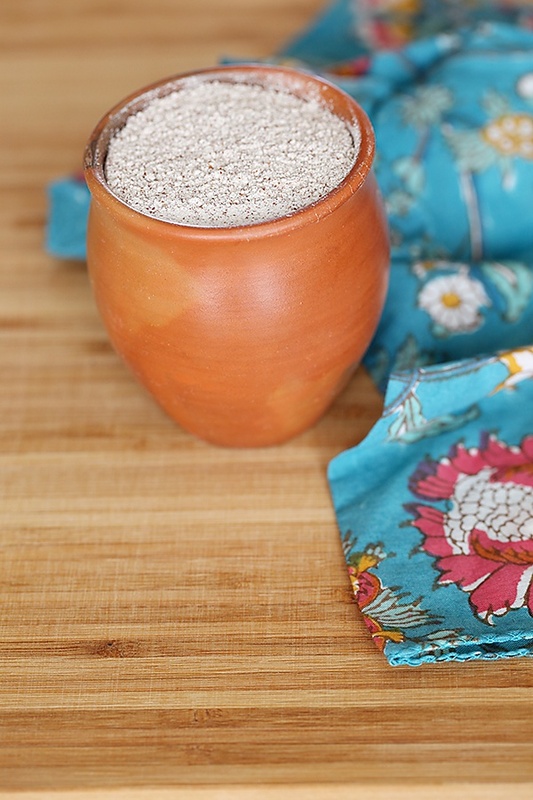 Melinda- I have used ragi flour for this recipe. Kindly go through it again. I have another post on homemade baby food in this space. Do check it out. Hello Anushruthi, thank you very much for this recipe- it has become a firm favourite in our house and we make it 2 or 3 times a week. I remember searching for ragi kanji recipes online and all the recipes felt so unappetising. This recipe is truly delicious. Also must congratulate you on your excellent website, lovely pictures, love the little anecdotes. i think if I need one word to summarise "harmonious" comes to mind. As a fellow foodie and vegetarian, it is very much in harmony with my principles. Shreya-Thank you for writing! Your feedback means a lot to me! my baby is 10 months old and i live in a cold place – shimla. I want to give him ragi but have been told that it has cold taseer so should not be given during winter. Can u tell me if i can give rag/sprouted ragi powder to my baby. Would you happen to know the same for bajr ? Shivani- You are right! 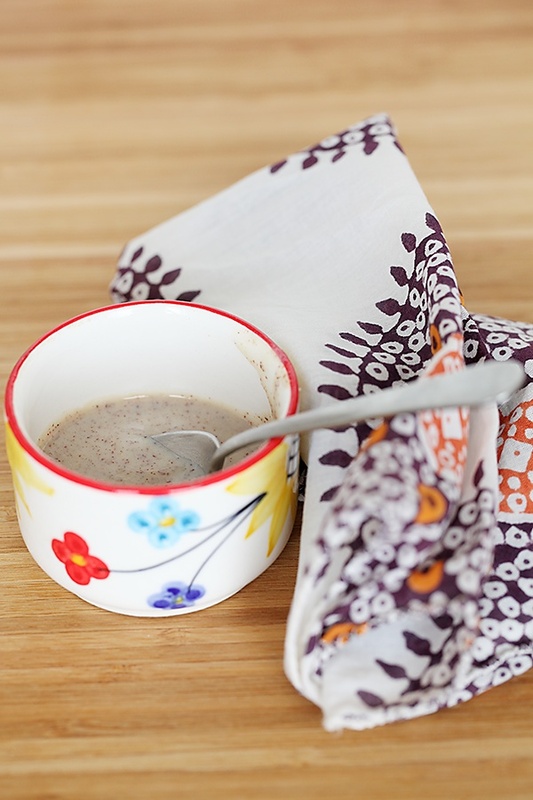 Ragi is very cooling, especially in winters. You can refer to my Homemade Baby Food recipe, I have used a mixture of three grains there and you can give it throughout the year. Hi Anushruti, Finally got round to trying this recipe…it's been on my mind for a while…the recipe was great…and I absolutely loved the end result…I'll be making this quite regularly for breakfast!! Thank you for a great recipe…it was extremely simple to make…and the photos helped with the final result! Cheers! Sarvani- Nice to know that! There is a video for the porridge. I will put it up here! Hi Anu! Can we mix jagger and milk? I love jaggery and hence delighted to learn this recipe! Saumya- Yes you can. Mix in the jaggery just before you turn off the heat or after you turn off the heat. Ruchita- This is ideal during summer season and hot weather for the day. I thought Ayurveda says no to the combination of milk and jaggery. Please tell me I have wrong information. You can combine milk and jaggery. There are so many traditional recipes with milk and jaggery. The way you present a recipe is so soothing to watch and the recipes are simple to make. I had watched this recipe of yours on YouTube and started making it since. My 3 year old daughter absolutely loves this and calls it 'Brown Halwa'. It has become the first thing I can think of while cooking her breakfast.